Last fall I bought 25 pounds of green cabbage from a local farm, and made sauerkraut with some of it right away. The remaining cabbages I stored in our basement refrigerator, and we’ve been enjoying them cooked in various ways over the past few months. Before they get all eaten up that way, though, I’ve been wanting to make one more batch of sauerkraut. I was up early with Connor and Ian this morning, and after breakfast I got a new batch going. Admittedly, it’s preferable to make sauerkraut out of fresh, newly-harvested cabbage, as it’s always best to preserve vegetables when they are at their freshest. But given that it’s march and there’s still half a foot of snow on the ground, our options are, shall we say…..a bit limited. So, root-cellared cabbages it is! 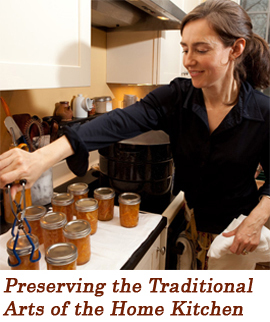 As long as your older cabbages have been stored properly, using them for sauerkraut shouldn’t be a problem. Just make sure to peel off and discard the outer layers of the cabbage, or any other part of it that looks a bit worse for wear, so that you are only using fresh, crisp, green (or red, as the case may be) cabbage for your kraut. Also be aware that older cabbages often have a slightly lower water content, so getting your salted cabbage to produce a good amount of brine can sometimes be a challenge. If this is the case, just follow the directions below on how to make additional brine for your kraut. Remove any wilted outer layers from the cabbage, then rinse cabbage thoroughly. 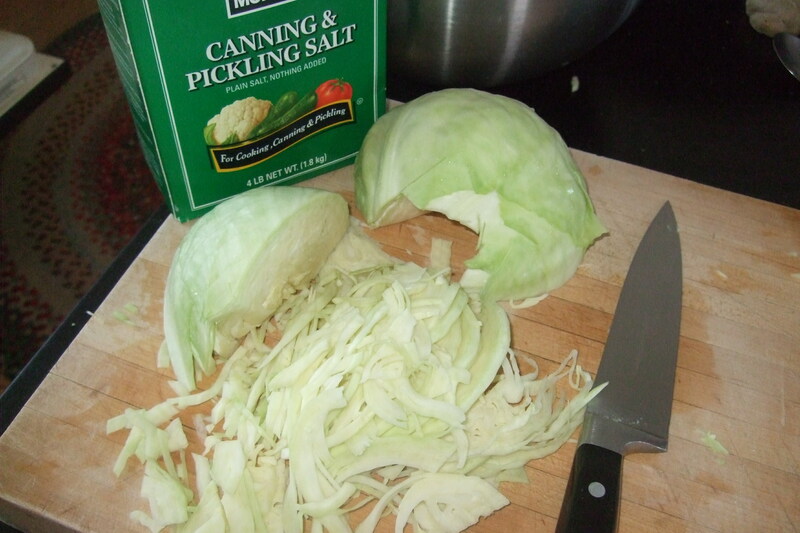 With a chef’s knife, cut cabbage heads in half, and remove center cores. 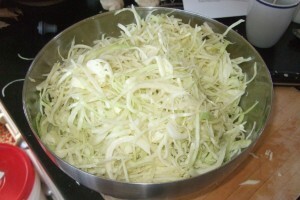 Then finely slice cabbage. Place cabbage in a large bowl as you cut it up. Add salt a little bit at a time as you go, and mix well as you go, using either your hands, or a utensil. This is to ensure that salt is evenly distributed throughout the cabbage. Once all cabbage has been cut up and placed in bowl, and all salt has been added, do one final, thorough mix. 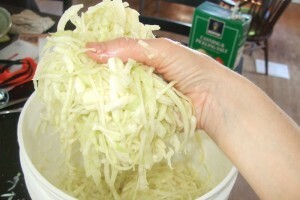 Transfer the cabbage to the fermenting crock or bucket in batches, packing down each layer as you go. You can use your hands for this, or another utensil (such as a potato masher). Tamp the cabbage down gently but firmly to help extract juice and encourage the formation of a brine. 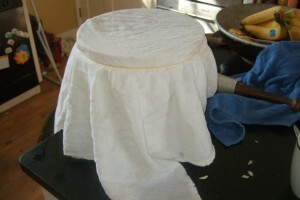 Cover the fermenting container with a clean cloth or towel to keep out dust. 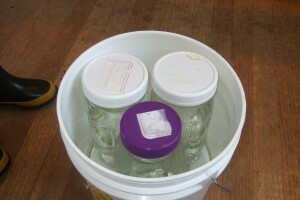 Place a rubber band around the bucket to hold the cloth in place. Place the fermenting container in an easily accessible place where the temperature is somewhere between 60 and 75 degrees. A kitchen or a basement is often a good option. Ferment cabbage for roughly 1—4 weeks, or until done. At 70 degrees (my personal temperature of choice for fermenting), it is likely that your cabbage will be done fermenting in 3 or 4 weeks. In general, the warmer the temperature, the faster the fermentation. Temperatures above 75 degrees are not recommended, and may cause spoilage. 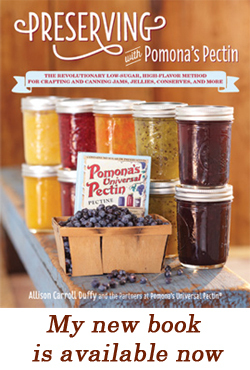 Likewise, fermenting at temperatures below 65 degrees may take 5-6 weeks to fully ferment. Check on the ferment every day, or every couple of days. After a few days, scum or mold is likely to form on the surface of the brine. This is normal. Carefully remove and discard any surface scum or mold. Rinse any scum off of the weight and the plate. Make sure to carefully replace the plate and weight, and ensure that the cabbage is fully submerged in the brine. Then, replace the cloth and continue with fermentation. Note: Fermentation failures occasionally happen. If for some reason the cabbage smells bad, or has become slimy, mushy, or oddly-colored, the cabbage may have spoiled. Do not taste. Discard immediately.